The anniversary concert to mark the 250th anniversary of the birth of Sir Harry Burrard Neale took place on 16th September at St Thomas’ Church Lymington. The church was packed for the concert and commemoration of the life of Sir Harry. The evening started with a brief welcome by Don Mackenzie, Chairman of the Burrard Neale 250 Committee and he thanked all of those who helped put on the concert including Walhampton School who provided an exhibition of Burrard Neale information including a reproduction of the admiral’s famous capture of two French ships. 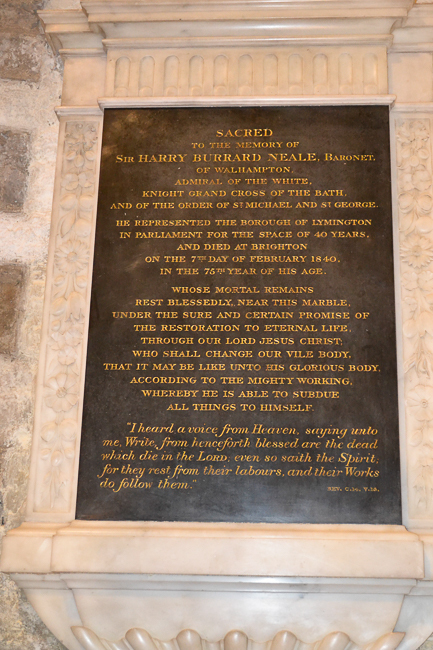 Don Mackenzie then handed over to the vicar of St Thomas’ Church, Peter Salisbury who unveiled the newly restored memorial to Sir Harry Burrard Neale that was funded by the Fulford & Burrard Trust, The 1805 Club and the Lymington Society. The Mayor of Lymington, Cllr Michael White then read messages of support from Their Royal Highnesses the Duke & Duchess of Gloucester, the Canadian High Commissioner, the Mayor of Vancouver. There followed a presentation of the life of Sir Harry which was dramatised by two members of the Lymington Players playing Sir Harry and his wife. There then followed an excellent concert by the band of HMS Nelson who treated the audience to a range of music from military marches to film music and jazz. The Lymington Society Chairman, Clive Sutton then asked the audience to show its appreciation for Peter Stone, who was the inspiration behind the Burrard Neale 250 project.